Portable desiccant dehumidifiers use a sophisticated process that depends on the chemical properties of substances to remove water from air. To do this effectively, the rate of moisture removal or dehumidification must exceed the rate of evaporation. Because desiccant humidifiers do not use a refrigerant type system to extract water from air streams, their performance is not hindered by dew-point temperatures. Portable desiccant dehumidifiers can pull moisture in a wide range of temperatures more efficiently than other dehumidifiers. Using hygroscopic material substances such as zeolite, silica gel or lithium chloride, these portable desiccant dehumidifiers can extract 300-400 pints of water per day and are still small enough to roll through a standard door opening in a residential setting. A fan normally draws in air and passes it through some slowly rotating wheels, containing the desiccant material. The air then leaves the unit as dry air through an outlet. To restore the desiccant to a dry state a small portion of the wheel will be heated causing the moisture it has collected to be released. The moisture is then exhausted to the outdoors through some ducting. Portable desiccant dehumidifiers are ideal for use in areas with low temperatures (below 70 and extremely large spaces. When compared to desiccant dehumidifiers, compressor driven dehumidifiers practically stop extracting moisture at temperatures below 70 degrees. Another reason why desiccant Dehumidifiers are preferred for low temperatures is that they are smaller, lighter and more compact that compressor driven units that achieve the same rate of dehumidification. 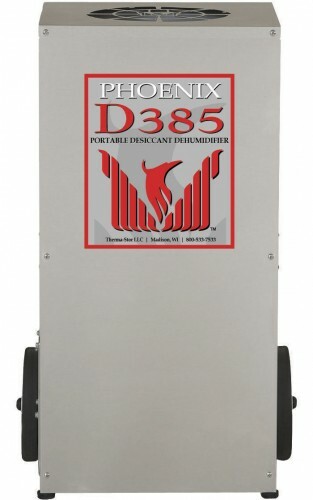 Some portable desiccant dehumidifiers like the Phoenix D385 are made with a unique design that allows users to operate the unit horizontally or vertically. This allows the dehumidifiers to be placed wherever they are needed despite of orientation. Targeted drying can also be achieved with this type of equipment. Additional design implementations such as the Multiple-ducting configuration allows for users to set up types of air flow such as negative, positive or neutral pressure air flows. This design is unique because it allows the portable desiccant dehumidifier to be placed in a drying space and isolate the reactivation air stream preventing it from contacting the air stream that is driving the dehumidifying process. Most users love the portable desiccant dehumidifier for the option of acquiring equipment that has multiple configurations and the fact of having high-capacity models that perform well in low temperatures. This article was published on Monday 17 December, 2012.